Even on PAX East’s crammed showroom floor, I felt isolated and anxious during my 30-minute demo of The Last of Us. With few supplies and a swath of enemies more physically gifted than myself patrolling the area, I did my best to approach each and every dimly lit encounter with covertness in mind. From dark corner to dark corner, I tiptoed my way to the rear of a grotesque Clicker – an enemy fully consumed by the cordyceps-type fungus running rampant. Crouching inches from his tattered slacks, I leapt forward and wrapped my tired arms around his rotting neckline. A button prompt flashed, reminding me that I didn’t have the required shiv to finish the job. The less-than-human creature squirmed out of my arms and hugged its pungent mouth around my jugular. He tore at my flesh, but the screen quickly faded to black before the rest of this Clicker’s feast was had. My sweat-coated hands wanted to let the DualShock 3 slip as far away from my grip as possible, but I wasn’t going to let that happen. I had 20 minutes of game time left, and a second date planned with a creature in desperate need of some antifungal cream. Before any of this action takes place, it’s easy to classify The Last of Us as a Naughty Dog game. The player character, Joel, controls similarly to the holly, jolly Nathan Drake. He may not possess the inhuman dexterity of Uncharted’s famed hero, but veterans of this studio’s previous work should feel at home controlling this black-marketeer. 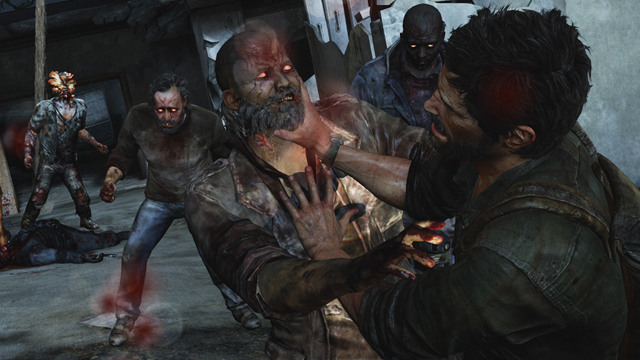 In the demo, female companions Ellie and Tess provide serious backup for Joel, but the group’s interaction is where The Last of Us begins to feel unique. Joel is hardened from this new, treacherous world, and shows little compassion to the survivors following his lead. A tangible tension is constantly floating in the stale air, and while that may sound unpleasant, it wonderfully matches the bleak tone. It doesn’t matter the survivor’s age, gender or creed: it’s sink or swim, and there’s no room for excess liabilities. Where Sully and Elena acted as comical, and at times romantic, counterparts on Drake’s treasure hunts, those who accompany Joel seem to be all that’s left to keep him safe and sane. As hinted at earlier, combat isn’t a run-and-gun paradise lined with easy targets. Each and every encounter is a tense, dangerous situation that requires some forethought. At times, it might be best to lob a glass bottle over a Clicker’s head to create a distraction. When dealing with the more human-like enemies who can be handled with a slick melee combination, pushing forward is ideal. However, limited supplies and the humanness of the player character makes combat feel much more like a puzzle than a bar brawl. It’s that inability to charge unabashed into the mouth of danger that makes The Last of Us such a tension-rich experience. You can almost feel the warm breath of the Clickers on your neck as you crouch through the murky rooms of the dilapidated building – never once feeling safe among their ear-piercing shrieks. The most enemy-rich portion of the demo had me deplete every ounce of ammo I was carrying with me, resulting in one of the most bone-chilling dead sprints to a safe zone I’ve ever taken in a video game. I never felt fragile, as Joel exudes a confidence and physical aptitude that kept my spirits high. And yet, every living thing in my proximity seemed to be on an even playing field, and that was refreshing. This isn’t a power fantasy built to boost your ego; Joel’s life can end in an instant, and it’s up to you to prevent that from happening. I hold the Uncharted franchise in the highest regard, but what I played of The Last of Us has me dying to dig deeper into Naughty Dog’s newest endeavor. It’s astounding that a studio so geared toward unrelenting action and big-screen setpieces can churn out something so engaging on the other end of the tonal spectrum, but I’m still on edge. I’m eager to see how it all pans out when The Last of Us hits the PlayStation 3 June 14.